Happy Weekend & HAPPY long Bank Holiday weekend to all in the UK, you’ve got to love an extra day to the weekend! 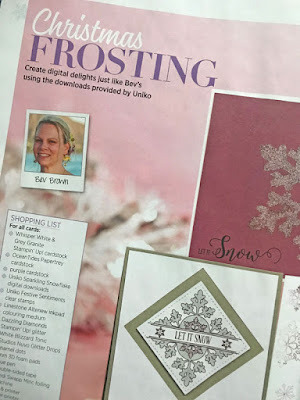 Today I am back to share a little more about the Uniko feature in Cards & Crafts for Christmas, which I shared on social media on Friday. I am always truly honoured to be approached by editors to design digital stamps and have my cards featured. 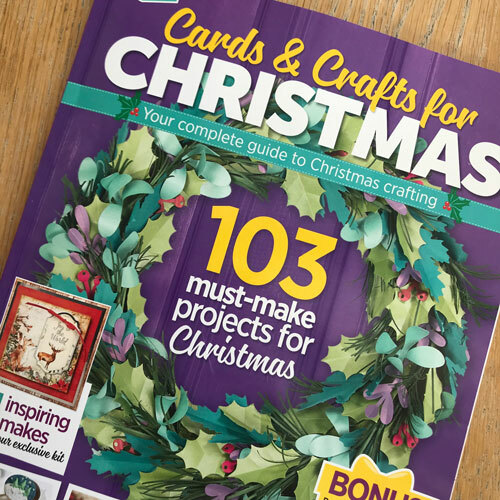 I also love sharing things for free, which brings me on to the feature in Cards & Crafts for Christmas…. The digital stamps can be downloaded from www.simplycardsmag.com and the digital stamps in the magazine can be found HERE, you will need to register to be able to download them. I’d LOVE to see if you use these freebies or any of the free digital stamps I have designed in the past. I have links to some of them HERE. 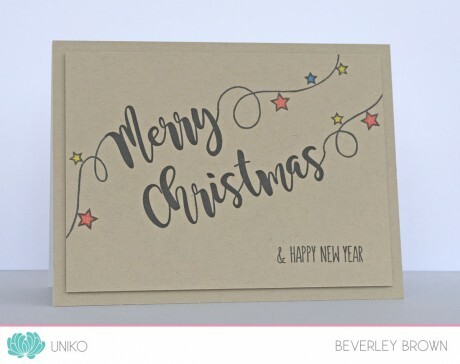 So if you have made something and blogged about it, email me a link to bev@uniko.co.uk OR if you have posted it on social media, such as Instagram or Facebook, be sure to tag @unikoltd or use the #unikoltd or #unikostamps and I will be able to find them. 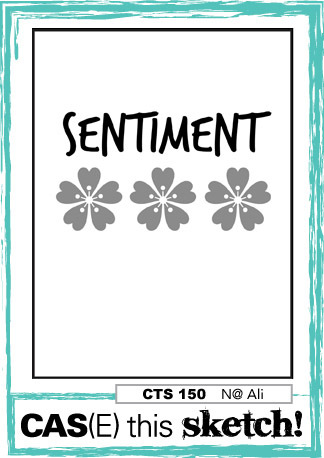 Welcome back to the NEW feature here at Uniko, Stamp Of The Week. Basically each week I will be choosing a stamp set to dust off & give some inky love to. 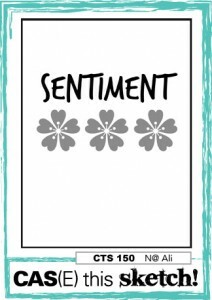 I am open to requests of stamp sets to revisit, so if you have a request either leave a comment or drop me an email. Along with giving the set some love, the featured set is also discounted in store for that week. How could I not feature this set, with the BIG day only weeks away?! 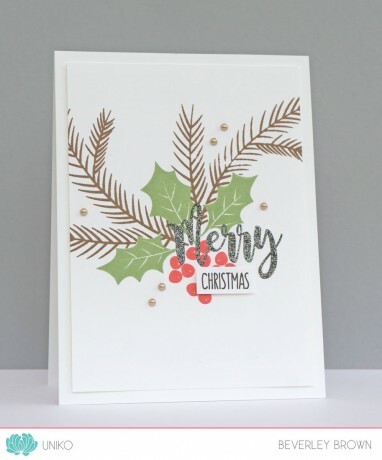 I still have a HUGE amount of Christmas cards to make, so this set will be seeing quite a bit of ink! 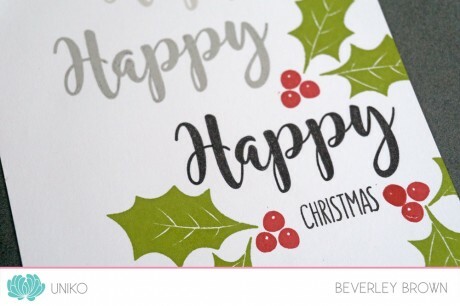 As you may remember I do like adding a diagonal interest to my card layers & this style was perfect for using up some scraps of DP that I have laying around. 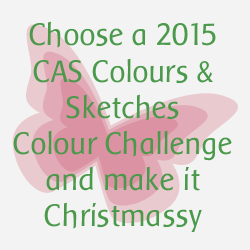 The monochrome green colour combo was inspired by the current CAS Colours & Sketches challenge HERE, which is to choose a colour combo from any they have used in 2015. The shades of green I used were ultimately determined by the colour of the polka dot DP from Papertrey Ink, which I think is Ripe Avocado. 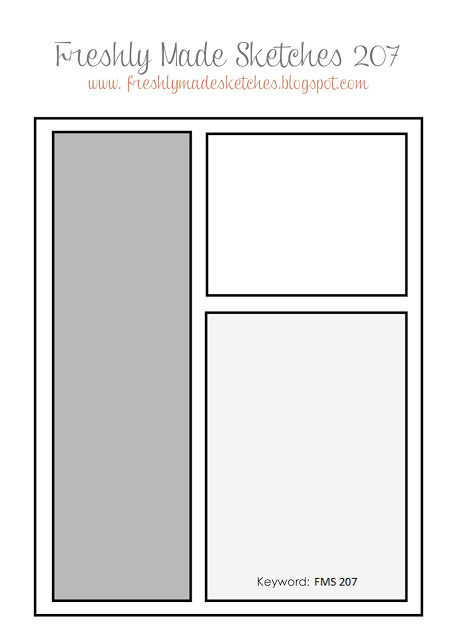 My card base is that shade too, along with the strip of card along the diagonal. 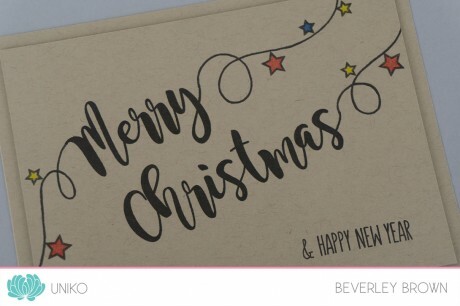 I stamped the tree & sentiment in SU! Always Artichoke for my 3rd darker shade of green. I added a trio of creamy white hearts to the sentiment for a little bit of simple added interest without overpowering the main design. Don’t forget that this set is 20% off this week HERE in store. 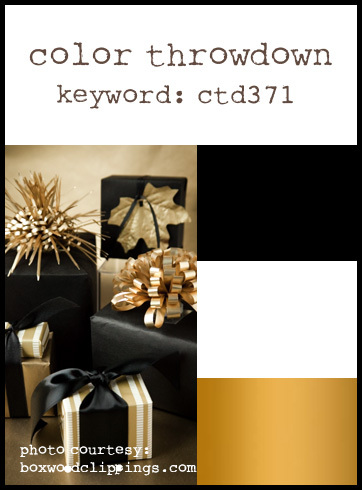 Plus we still have our festive shipping offers on! Anyway, I have a few more minutes of the beans nap time, so I had better finish getting a couple of orders packed up. It’s a sunny afternoon, so a nice walk to town and the post office is on the cards. This clear stamp set is one of my all time favourites and so I had to ‘feature’ it before Christmas. 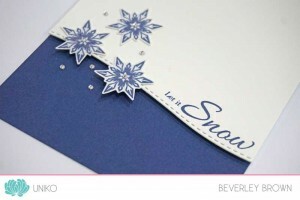 I simply love snow and snowflakes & wish it snowed here in the UK more often! 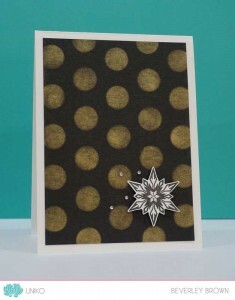 Todays card is almost a one layer card, but the die cut gold SNOW & tiny rhinestones adds a postal friendly layer to it. 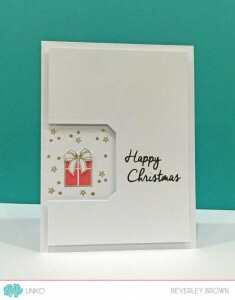 This card was inspired by this non Christmas card HERE and below. 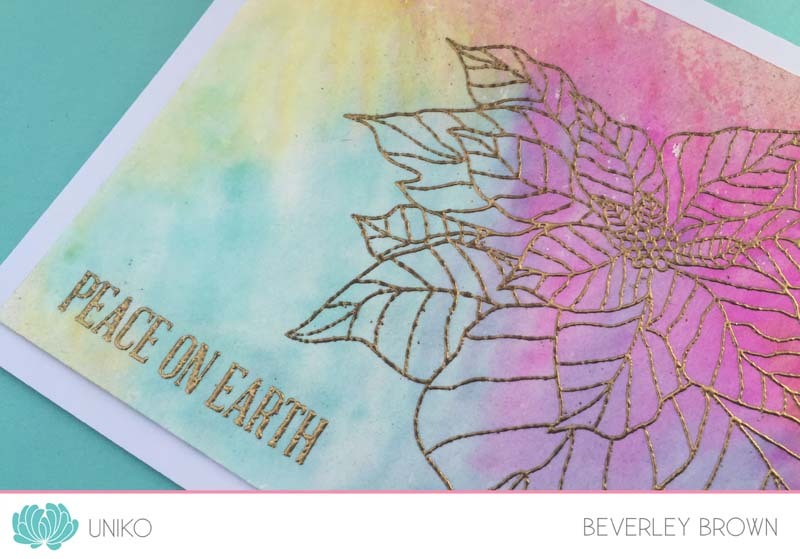 The colours for my card are inspired by the current CAS Colours & Sketches challenge HERE which is a colour challenge, but you get to choose from any of the 2015 colour combos. Today we have family visiting, so I might not get much time in the studio to create. Hopefully I will get time to make one last card using this set to share with you tomorrow. 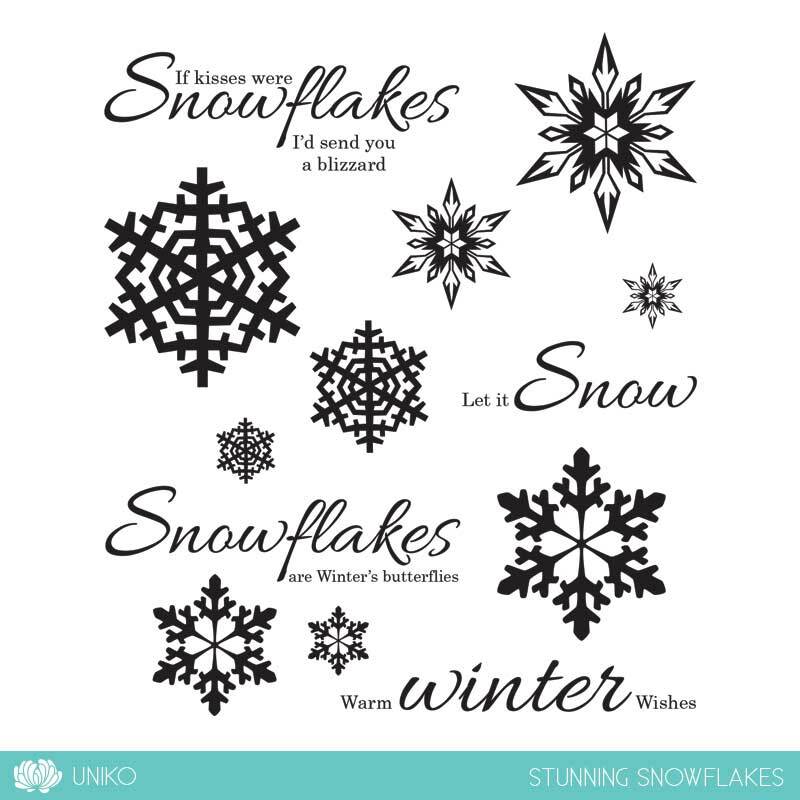 Don’t forget that the Stunning Snowflakes set is discounted this week & will be back to it’s normal price on Monday. We also have FREE UK SHIPPING & all international orders will receive a £3 shipping refund. Until the next time, thank you for stopping by today. I’ve combined 2 challenges for this card, first up the layout and overall design is based on this weeks CAS(E) this Sketch! 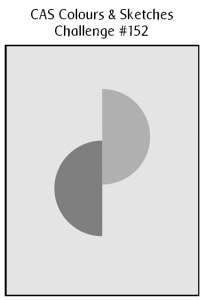 layout seen HERE and below. I started out with a different version of this card but made a few boo boos on it so abandoned it, I may try it again & share if it works! Then I remembered I have the SU! 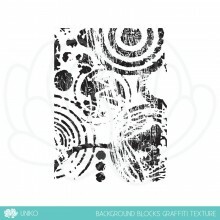 polka dot stencil and decided to do some ink daubing through it, something I’ve not done much of at all. So much so that I couldn’t even find a dauber! 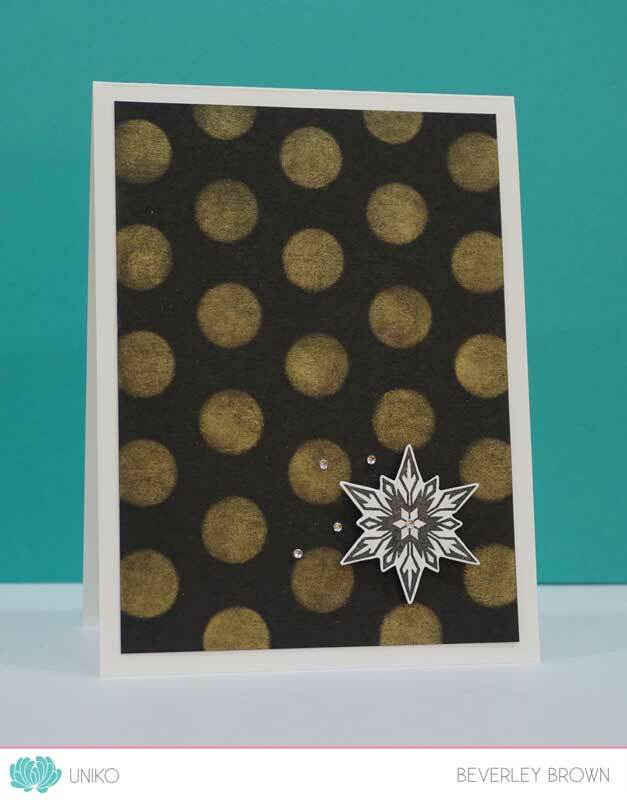 I used a dry baby wipe instead to brush the ink onto the black CS through the stencil which has resulted in a softer edge to my gold polka dots. Secondly the colour scheme of my card is inspired by the new Color Throwdown challenge colours seen HERE and below. Usually I would use less black and more white and gold but decided to give the black more focus. 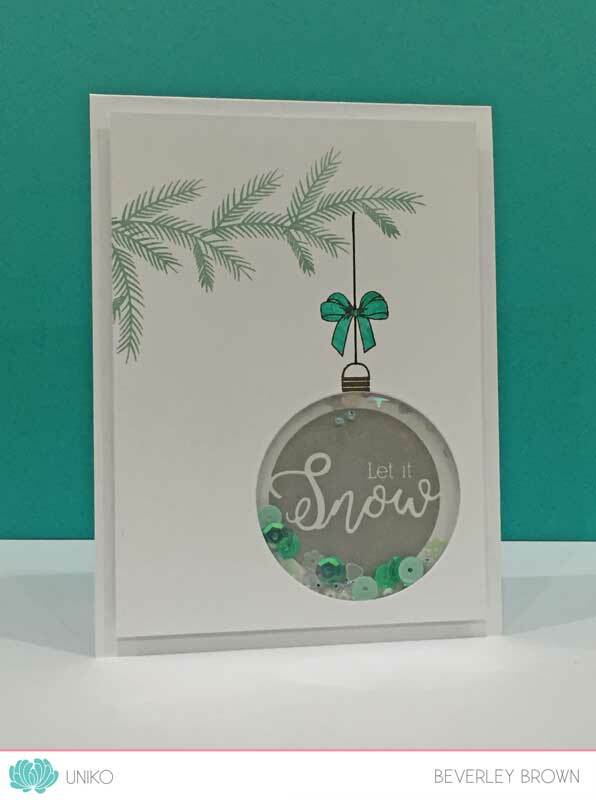 Instead of adding sentiment I decided to leave the card sentiment free & add a few rhinestones for added shine and sparkle. 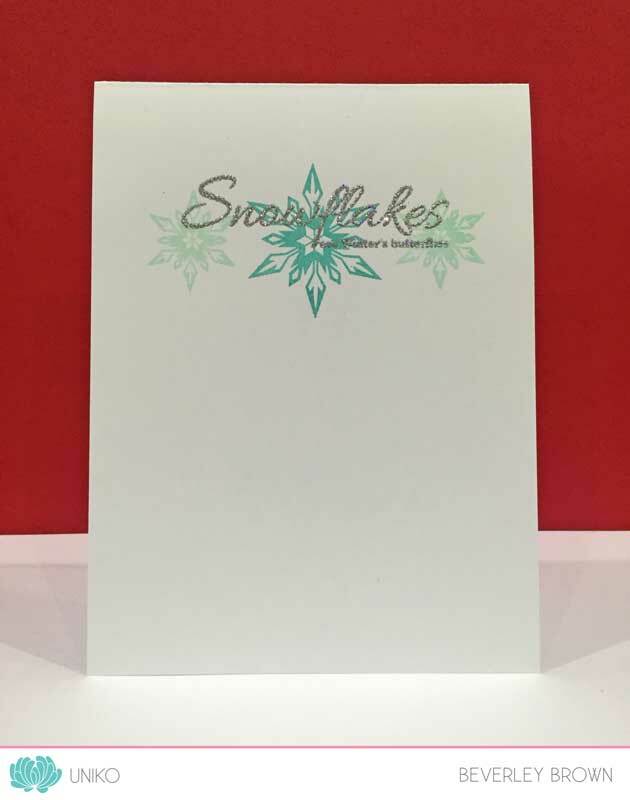 The stamped & fussy cut snowflake is adhered to the card using foam adhesive and lightly brushed with a clear Wink Of Stella pen. That’s all from me this evening, it’s been another long day with the beans today. They were tired following their afternoon at Grandma’s & Grandad’s yesterday and so were quite irritable at times and quite demanding for attention. Hence this mummy is quite tired now! I have some December Daily to catch up on so I might relax in the studio and have a play! I will be back tomorrow with more to share using this set & until then, thank you for stopping by. Another super CAS card. 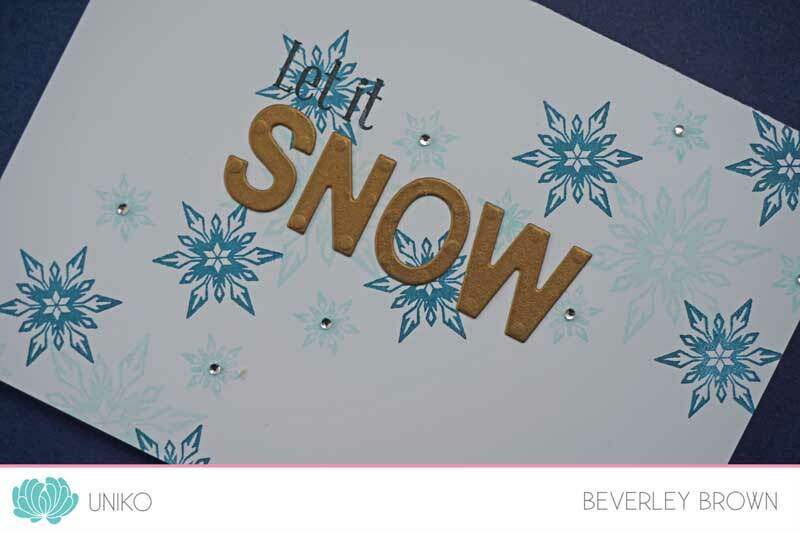 I am rather pleased with it and although the snowflakes were the fussiest part to cut out, plus I’ve used foam adhesive I might actually select this design as one to mass produce for Christmas! Yep, out of all the designs I have been sharing over the past few weeks (which I will use) I haven’t decided upon or made a batch to send out *gasp*! 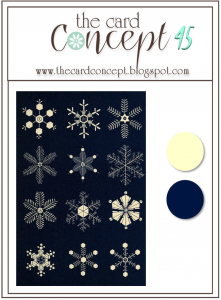 It looks like snow & snowflakes are popular around blog land this week as there are a couple of challenges with the theme. First up the colours I used on my card were inspired by The Card Concept challenge seen HERE and below. Ok, that’s all from me today, I am ‘trying’ to do December Daily this year and I am already behind. I didn’t really get into the ‘planning’ mode for it so it’ll probably be a work in progress for the first week. I have taken LOTS of photos and I plan on getting the journalling for yesterday & today done before I forget what happened! I am using a Project Life album and pages that I have had for AGES, but the whole PL/scrapbooking/journalling is very different for me. Though I am a little daunted, the fact that PL works in small areas at a time I ‘should’ be OK! Haha! Anyway, I will be back tomorrow for more to share, until then THANK YOU for stopping by. Countdown to Christmas Blog Hop! 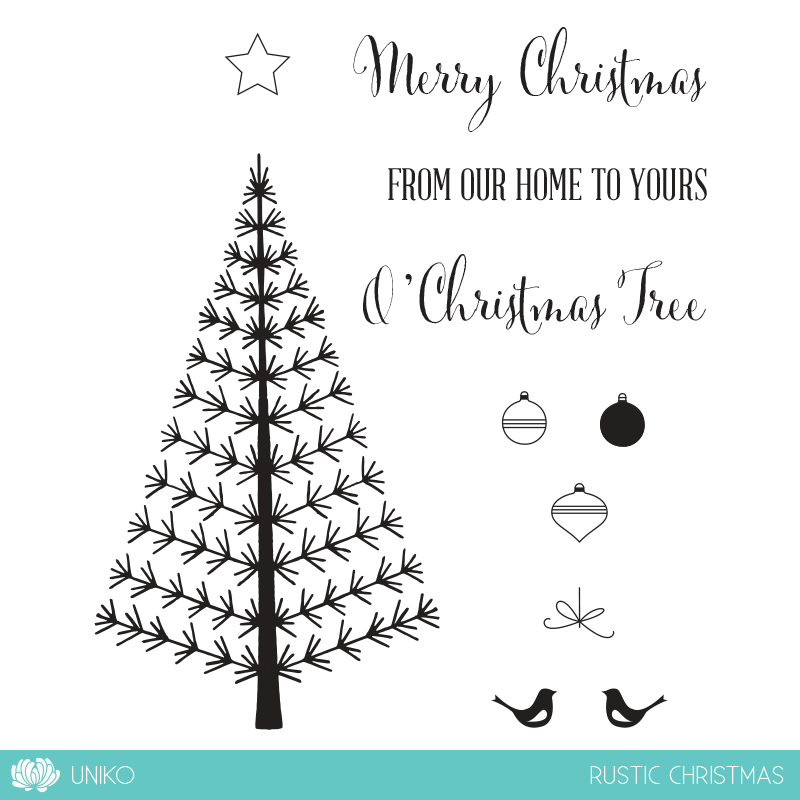 Welcome to the Uniko Countdown to Christmas Blog Hop! 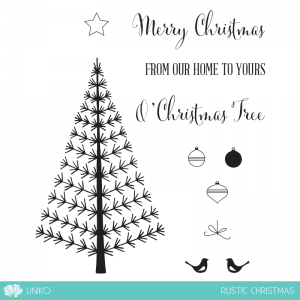 I am so glad you have stopped by today as today we have a Uniko Design Team Countdown to Christmas Blog Hop (To start at the beginning of the blog hop CLICK HERE). 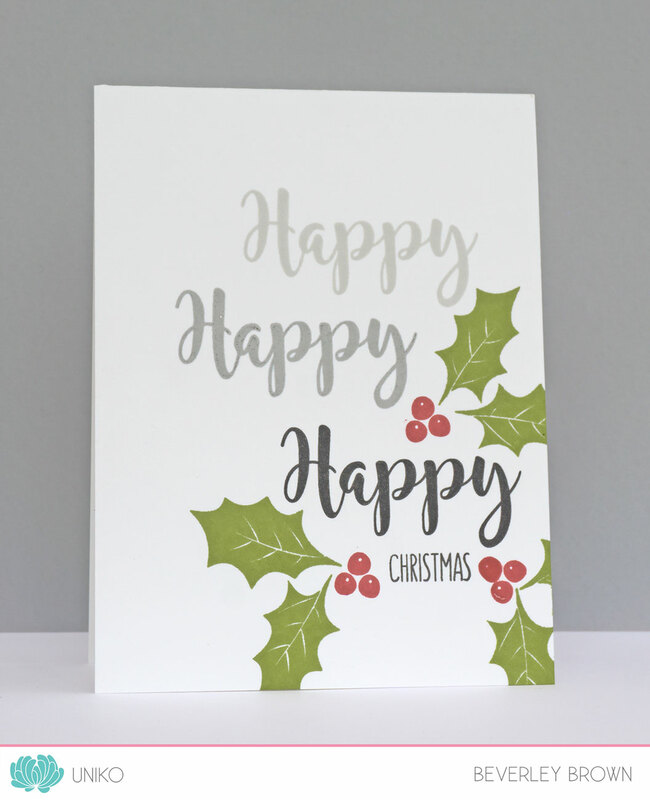 I decided to put on this extra Design Team blog hop as not all the team received their November Release goodies in time for the release day blog hop HERE. First up I have another card using Essentially Christmas. This time I wanted to focus on the little present/gift box in the set and a couple of the smaller accent elements. 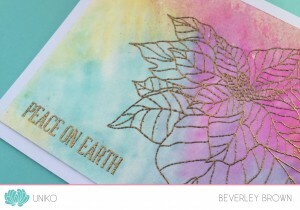 As you can see I 2 step stamped the gift in VersaMagic Red Magic & Encore gold inks. The gift is topped with the bow from Jingle Bells as I wanted a more ‘poofey’ bow! 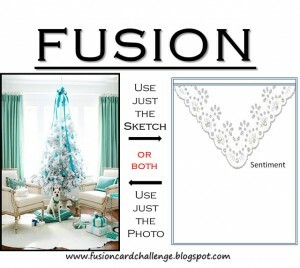 Again, I was inspired by the colours & photo inspiration from the current Fusion Card Challenge HERE and seen below. I just love the colours, they’re one of my favourite Christmas go to combos. 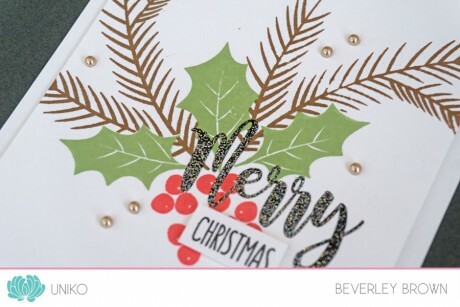 I just so happened to have the ‘perfect’ shaker card mix of sequins that I bought months ago from ‘Little Things from Lucy’s Cards’. For my card I have combined the bow & fern from Jingle Bells with the Let it Snow & bauble hanger from Labelled Christmas. 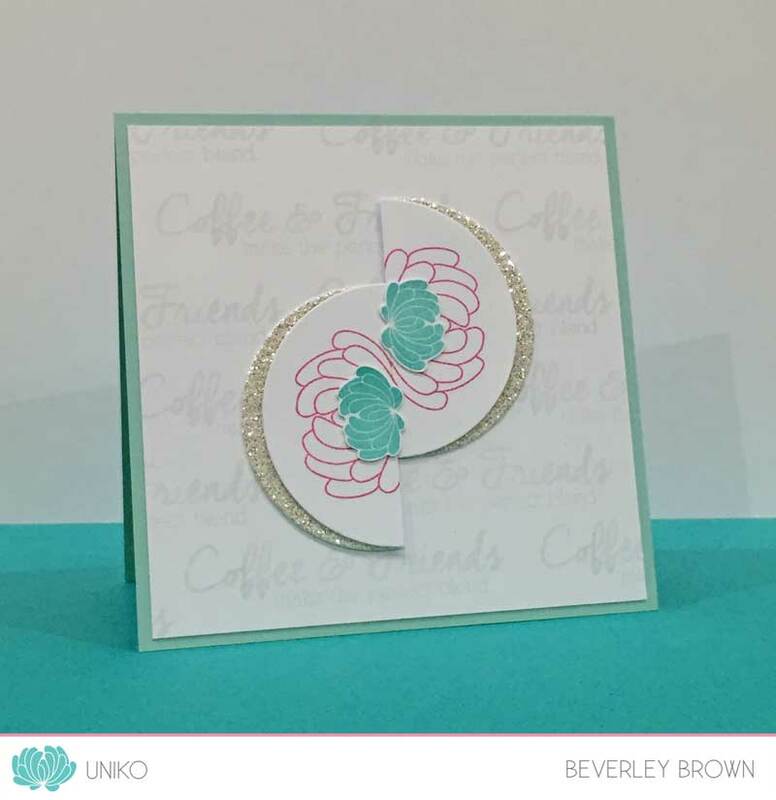 This card was inspired by the current CAS Colours & Sketches challenge seen HERE and below. As you can see it is a sketch challenge. I have been lucky enough to be Guest Designing for CC&S for the month of November & you can see my GD card HERE. Which I really liked, but as you can see I ‘bent’ the rules quite a bit & I didn’t stick to the half circle elements in the sketch (Sorry CC&S). So this time I did! It turned out to be the perfect sketch to show you the size difference between the Uniko logo flower contained in the I LOVE Coffee set compared to the same flower contained in the previously released Flower Power #3 set. Another thing I discovered was how the larger outline flower from Flower Power #3 can be ‘joined’ together when stamped to hang over an edge I think it helps join the two semi circles and the design to flow. 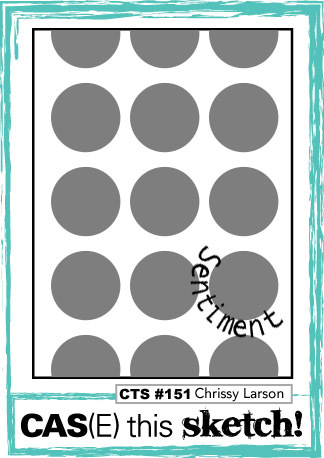 After I had done my focal elements I wanted a sentiment but couldn’t find a suitable placement over the semi circles, so I decided to stamp the sentiment ‘Coffee & Friends make the perfect blend’ on my white CS panel in VersaMark Dazzle Champagne ink. Ok, that is FINALLY all from me today! Remember, simply visit & comment along the hop by midnight Saturday 5th December, to be in the chance of winning the ENTRIE release! The WINNER will be announced Sunday 6th December. All the new products showcased today are available HERE on the website. We also have a Black Friday weekend SALE on AND we have some products RETIRING which are at a discounted price until all stock of the retiring items are sold. THANK YOU so much for stopping by today & joining in on all the fun. I hope that you all have a wonderful festive season. 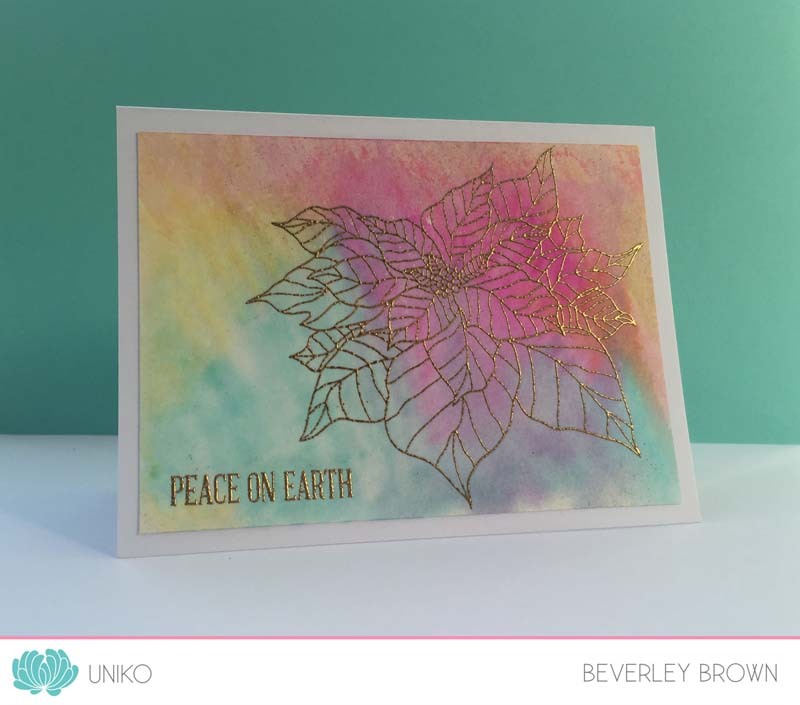 I’m here today along with our Guest Designers & some of the Design Team to remind you that there is still time to join in on the current Uniko Challenge HERE. This month we have two wonderful Guest Designers, firstly our winner from Challenge #25 Jen from The Other Fickle Pixie and Shona from Twine Around. Be sure to stop on by their blogs to see what they have created & why not have a peek around their blog too, you won’t be disappointed! 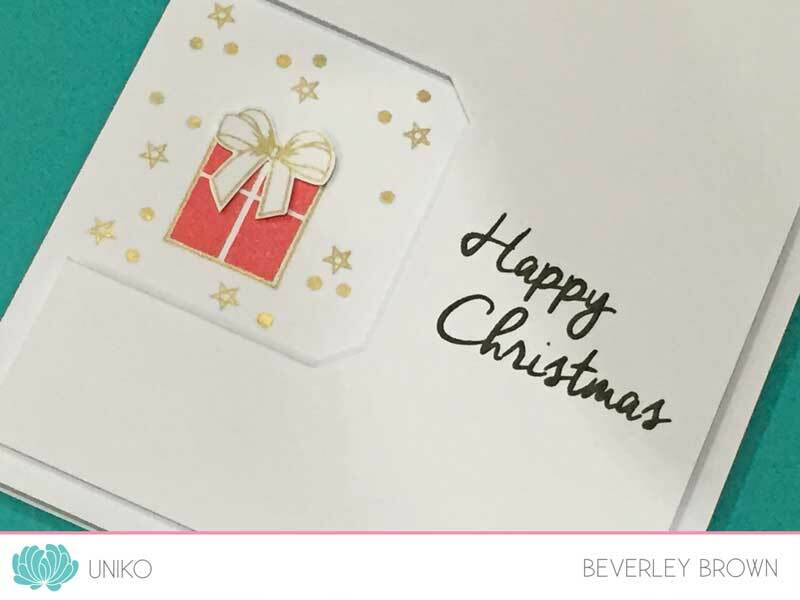 Don’t forget to visit the Uniko Design Team too & see what they’ve created, all the links to their blogs can be found HERE on the challenge post. As you can see I have gone super CAS for this one & one layer too, perfect for mailing out! I used a few other challenges to spark my creativity. First up is the current 2 week challenge at CAS(E) this Sketch! 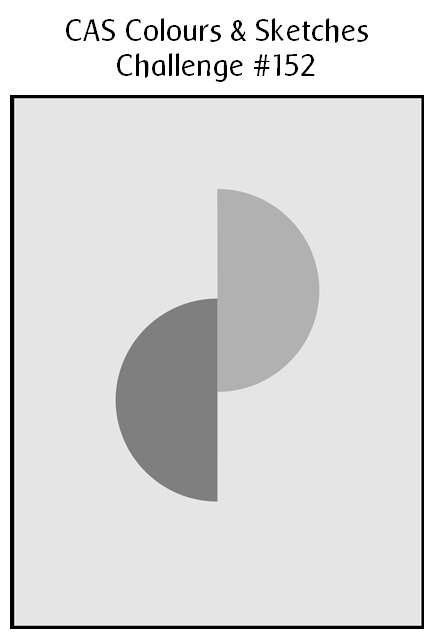 seen HERE and below. I’ve had so many ideas whirling around for this sketch but with being ill I hadn’t found time to join in. I was also inspired by the new Fusion Card Challenge HERE and seen below, I used the colours from the inspiration photo. Such lovely turquoise/blue tones with sparkly silver & white. 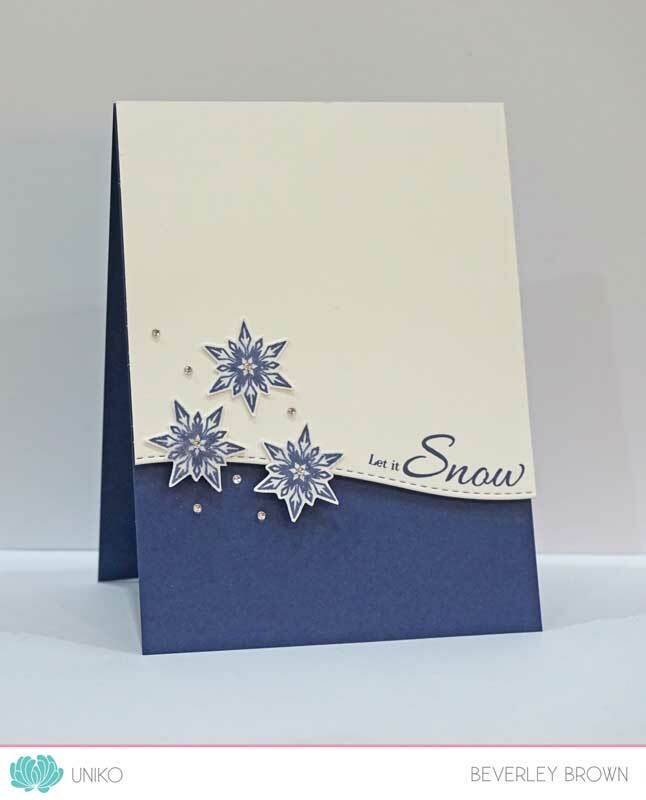 As you can see from this close up below, I have used 2 snowflakes from Stunning Snowflakes & heat embossed one the sentiments from the set with Stardust EP for the sparkle! I was going to say I used one of my favourite sentiments from the set, but I actually LOVE them all! Haha! Uniko have a special Black Friday event on, we have over 50% off selected clear stamp sets on the SALE page & also on the RETIRING page. Be sure to grab yourself a bargain, as stock is very limited on some items. The SALE ends on Sunday 29th November, but the RETIRING items will remain reduced until all stock is sold. 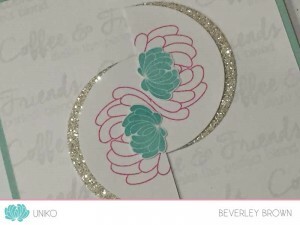 Stamp of the Week is a new feature here at Uniko. It is one I have been wanting to do for some time & with the results of the recent survey I did it is something 69% of you wanted too. Even though every other month the DT and I revisit a previously released set, there are MANY more clear stamp sets that deserve some LOVE! So, what is stamp of the week? 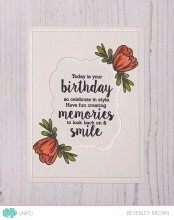 Well, each week I will be focusing on a different stamp set on this the Uniko website blog, I will be featuring a variety of cards, tags, projects and hopefully videos. 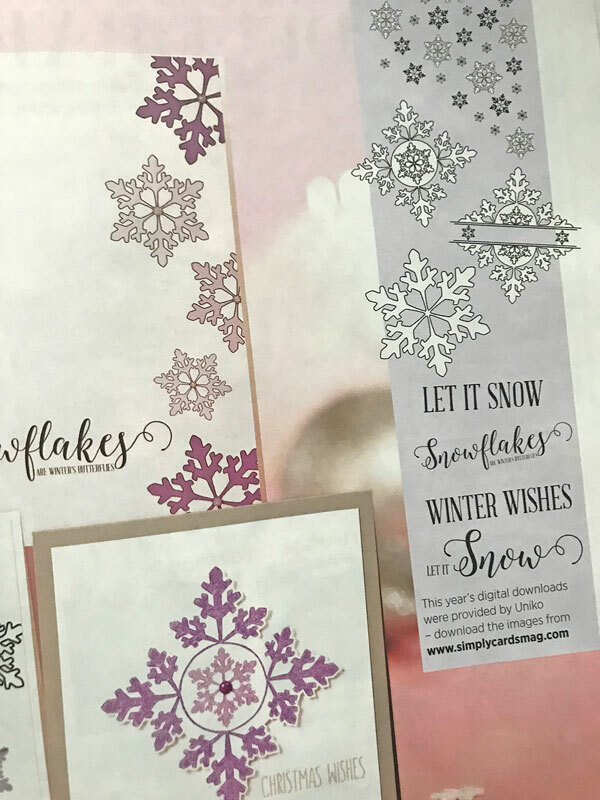 The stamp of the week will be the main focus but I will also be showing how it pairs with other products from Uniko & other reputable companies. 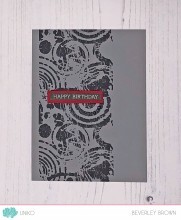 Along with all that the featured stamp set will be available in store at a discounted price for that week only. 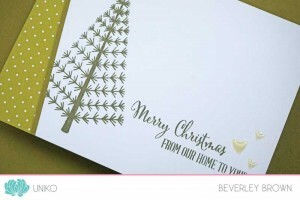 I am loving the current trend of gold embossing and decided I wanted to do that on todays card but I didn’t want it paired with traditional Christmas colours. So out cam my Zig Clean Color Brush Pens, a large acrylic block and a mini mister. To create the background I simply coloured my acrylic black with the trio of pens, misted and then applied it straight onto my watercolour paper. 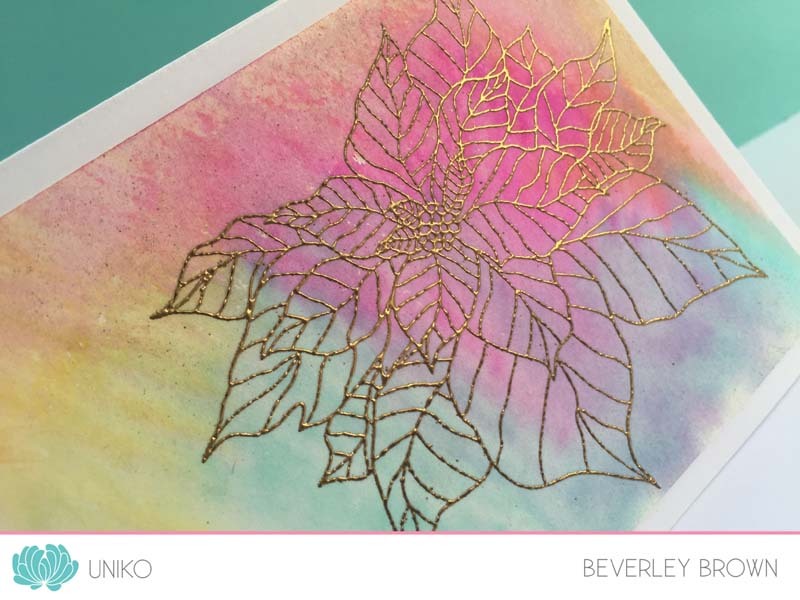 After leaving it to dry I then gold embossed the poinsettia & my chosen sentiment. I then placed it under a heavy book overnight and flat mounted it onto a white card base. 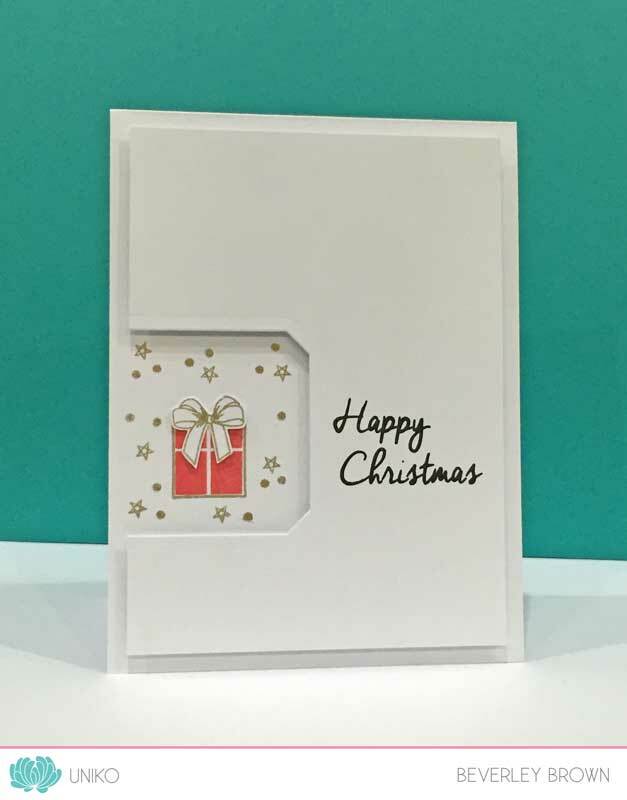 This would be a really quick & easy, last minute Christmas card idea & you could easily switch the background colours to more traditional ones if desired. Ok, that’s all I have to share with you today, but I will be back again tomorrow with more to share using this clear stamp set. I hope you are enjoying the feature here & what I am creating! Don’t forget we have the October DT Blog Hop & GIVEAWAY going on HERE and you could win this set! It just so happens that Pure Florals: Poinsettia is the stamp set the DT and I are revisiting this month HERE on the other Uniko blog. 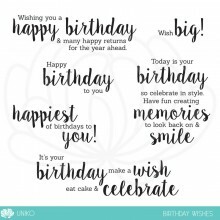 So you will have TONS of inspiration using this set when the week is out AND you also have the chance to win the set or a Uniko eGift Certificate to the same value. How good is that? I was inspired by the current sketch seen below & HERE over at Freshly Made Sketches, it was simply perfect! 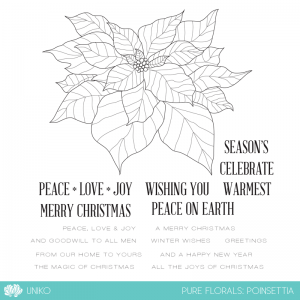 I designed the Poinsettia to be large enough to be the focal point of the card but then I didn’t want it to be too large for a card or tag. 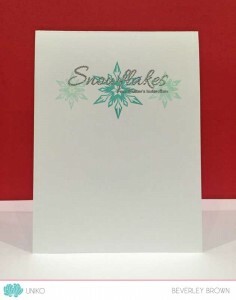 I also designed it so that it can be fussy cut and layered. The DT have showcased this feature in the October DT Blog Hop HERE perfectly. 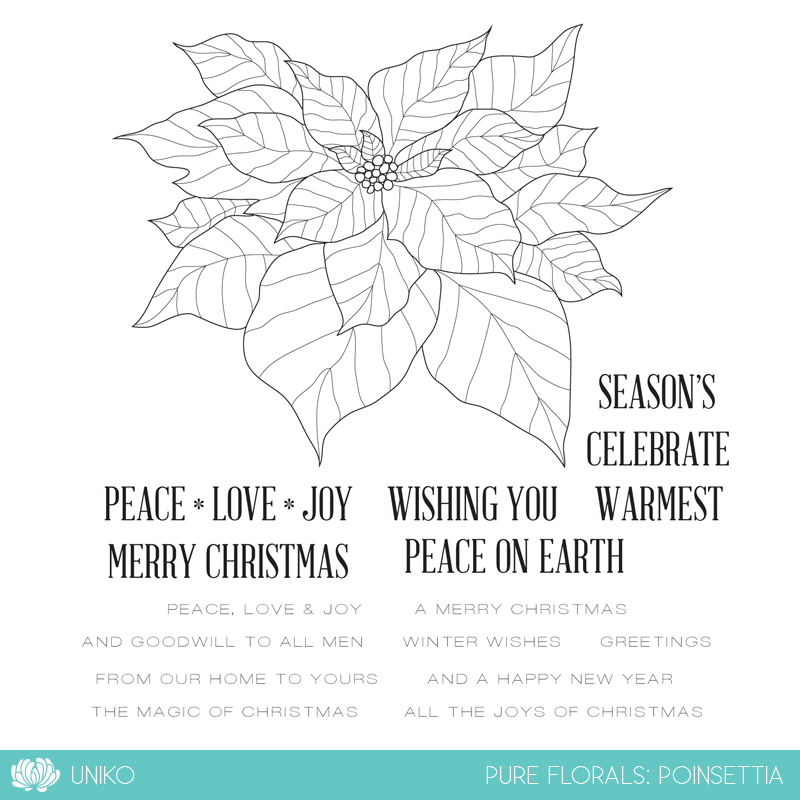 As you can see I rotated the sketch 90 degrees counter clockwise, I felt it worked better that way for the poinsettia. One of my favourite colouring mediums is my Prismacolor pencils and gamsol blending solution. 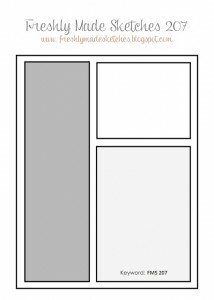 I first became aware of this from the awesome Jennifer McGuire back in 2008! 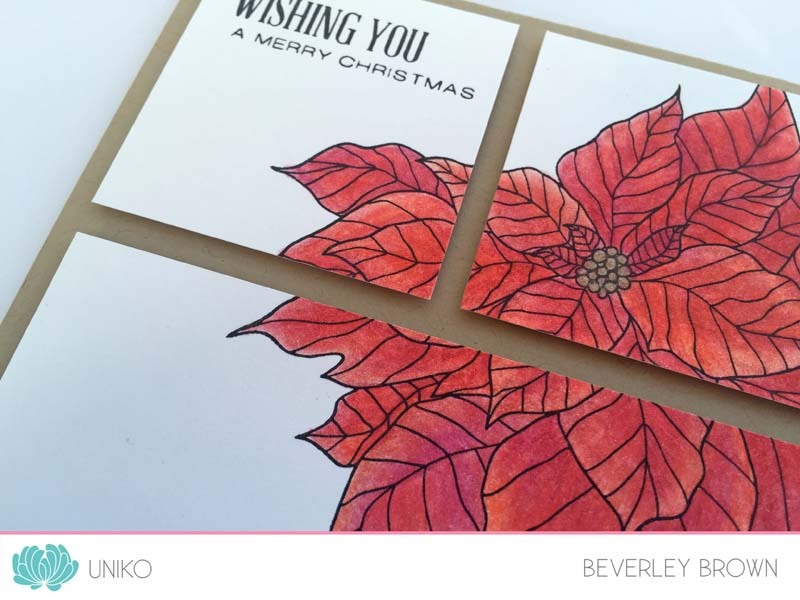 I love how the poinsettia really takes the focus of the card and is enhanced by the cut gridlines to create a story board effect. 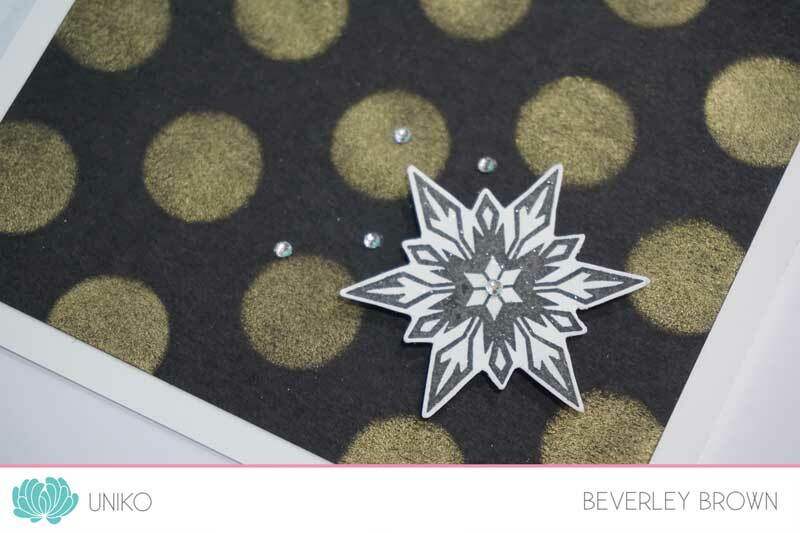 A current growing trend in the paper crafting world. 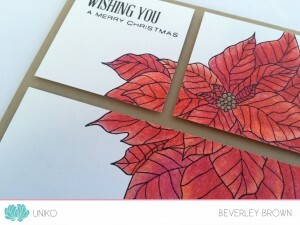 Ok, that’s all I have to share for today, I will be back again tomorrow with more using Pure Florals: Poinsettia. 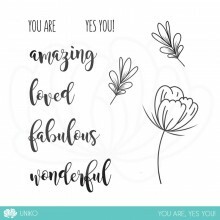 I do hope you will pop by again and enjoy this new feature here at Uniko.